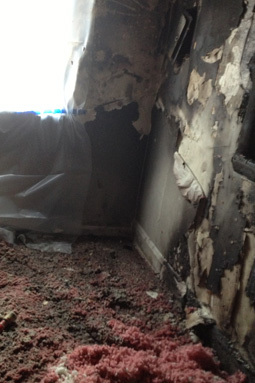 We understand the terrible effects of fire damage, whether it comes from a house fire or puff back. ServiceMaster by Libby Green offers top of the line services to restore your home back to its original state. ServiceMaster by Libby Green offers emergency board-up services, deodorization and restoration of the contents within your Harford County or Baltimore County home. 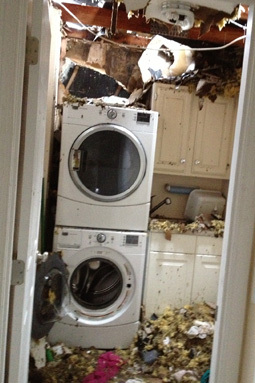 We are able to have a crew on site as soon as possible to determine what can be salvaged and do so immediately. So if you need fire restoration, including soot and smoke removal in Bel Air, Jarrettsville, Forest Hill, or surrounding community, give us a call immediately! Since smoke will permeate walls and get trapped in household ducts, it is crucial that the restoration professionals not only remove smoke, but also remove lingering smoke odors. We use a hydroxyl generator to deodorize contents both on site and off site. The hydroxyl technology is able to remove moisture from the air creating plasma of hydroxyls. The plasma is environmentally safe for people, pets, and plants unlike other methods of deodorization. Just as hydrogen-peroxide kills bacteria on a wound, the hydroxyls this machine generates will destroy odors and other pollutants in the air and surfaces. ServiceMaster by Libby Green is one of TWO restoration companies in the state of Maryland to own the Omegasonics Restoration Pro. The Omegasonic machine uses ultrasonic technology to restore your contents back to their original state and limit the amount of your contents deemed non-salvageable. So when you’ve experienced the trauma of fire damage to your home, contact the restoration and cleaning professionals of ServiceMaster by Libby Green. We provide smoke removal, deodorization, and fire restoration in Bel Air MD and surrounding communities in Harford and Baltimore Counties. Don’t wait for fire and smoke to cause lasting damage to your home, contact ServiceMaster by Libby Green today!